This Friday, the U.S. Bureau of Labor Statistics (BLS) will release employment data for the month of March, a little more than two weeks after the Federal Open Market Committee (FOMC) met with newly appointed Federal Reserve Chair Jay Powell and voted to raise interest rates for the first time this year. At the meeting, the FOMC indicated that there would be two to three additional rate increases this year. Some economists, however, argue that it is still too early to raise interest rates, as there is evidence that the economy isn’t yet at full employment. Notably, a tighter labor market and full-employment policies would disproportionately help America’s most disadvantaged workers, including workers with disabilities, formerly incarcerated individuals, and workers of color. Overall unemployment is low, and the employment rate is growing—but these top-line statistics mask underlying disparities across demographic groups. One group whose labor market challenges are often obscured by overall figures is workers with disabilities—a group that is often left out of the conversation when it comes to labor market policy. As shown in Figure 1, while the unemployment rate for prime-aged workers with disabilities is at its lowest since 2009, it is still a whopping 10.8 percent—well above the peak nondisabled unemployment rate in the aftermath of the Great Recession. These numbers are an important reminder that the Fed must allow the labor market to tighten further in order to close the gap between the economic outcomes of workers who have been doing well, such as white nondisabled workers, and less-advantaged workers. Indeed, economists and policymakers should be evaluating the health of the labor market based on how the most disadvantaged members of the population are doing—not solely on the overall numbers—when the BLS releases its monthly employment numbers. Beyond monetary policy, there are many steps policymakers can take to help people with disabilities enter, re-enter, and/or remain in the labor market, including by raising the minimum wage and eliminating the subminimum wage for people with disabilities; expanding Medicaid; and strengthening the Earned Income Tax Credit (EITC), among other steps. This column will focus on the labor market outcomes for workers with disabilities—a group that has seen limited and lagging economic gains from a tightening labor market and that continues to experience worse economic outcomes compared with their nondisabled counterparts. The analysis uses data from the Current Population Survey (CPS), the authoritative source of data on the U.S. labor market. Compared with other Census Bureau surveys, the CPS contains a less extensive series of questions on disability and only inquires about disability for individuals aged 16 and older. * According to CPS data, more than 11 percent of the civilian noninstitutional population aged 16 and older have a disability, including more than 6 percent of prime-age individuals—those aged 25 to 54—and almost 4 percent of all U.S. workers. ** Other government surveys with more extensive questionnaires on disability show that nearly 1 in 5 Americans lives with some type of disability. Since all data analysis in the column uses CPS data, the authors borrow the survey’s definition of disability—whether an individual identifies having “physical, mental, or emotional conditions that cause serious difficulty with their daily activities.” This column focuses on prime-age workers with disabilities to control for the effects of aging on economic outcomes and disability status. A complex web of systemic, structural, and societal barriers has played a role in depressing employment outcomes for workers with disabilities. Compared with nondisabled workers, disabled workers have higher unemployment rates, lower employment rates, and higher rates of self-employment and part-time employment. In addition, employed workers with disabilities often earn lower wages and are more likely to lack protections—such as paid family and medical leave—that would help them succeed in the labor market. Disabled workers often face discrimination, stigma, and physical and financial barriers to sustaining employment. The compounding of all these factors means that disabled workers are much more likely to experience economic insecurity. In 2016, for example, 20.9 percent of individuals with disabilities lived in poverty compared with only 13 percent of those without disabilities. 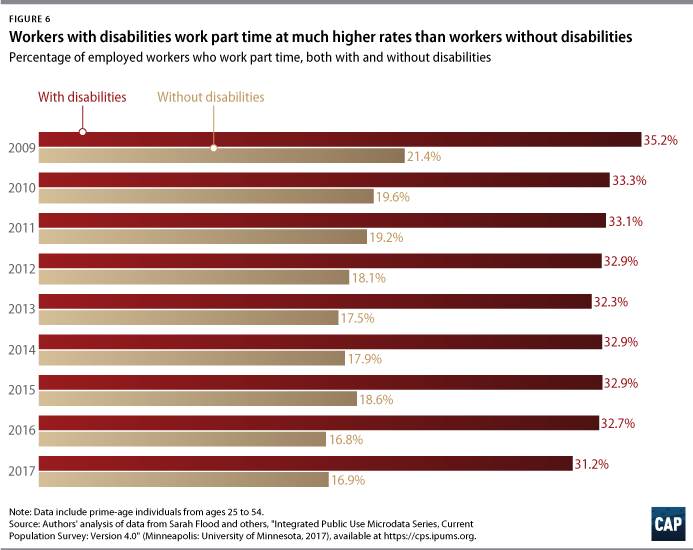 The unemployment rate for workers with disabilities is much higher than that of their nondisabled counterparts, as shown in Figure 1. In 2017, for example, the unemployment rate for workers with disabilities was 10.8 percent—three times the rate for workers without disabilities, which was 3.6 percent in that same year. And while the unemployment rate for disabled workers is at its lowest since 2009, it is still 2 percentage points more than the peak unemployment rate of 8.4 percent nondisabled workers experienced at the height of the Great Recession in 2010. Disabled workers often face worse economic outcomes such as high unemployment and poverty rates due to a number of compounding physical, social, and systemic barriers. For example, disabled workers often lack access to affordable, accessible transportation, which is a vital factor in obtaining and keeping employment. Housing insecurity due to unaffordable and inaccessible housing options has also posed a barrier to employment for people with disabilities. According to a 2017 report on homelessness by the U.S. Department of Housing and Urban Development, nearly 25 percent of homeless people report having a disability. Inaccessible workplaces also pose a major barrier for many disabled workers, and at least one-third of nonworking people with disabilities face employment barriers that could be resolved by addressing workplace accommodations. The report concludes that providing work accommodations such as flexible work schedules and transportation assistance would be effective in increasing the employment rate for people with disabilities. The employment-to-population ratio, also known as the employment rate, measures the share of people within a group who are employed. Many economists view the employment-to-population ratio as a better measure of labor-market health than the unemployment rate, which only indicates how many people without a job are also currently looking for a job. The employment-to-population ratio for prime-age people without disabilities is more than twice the rate for people with disabilities, meaning a much greater share of individuals with disabilities cannot or do not participate in the labor market. For both groups, women have lower employment rates than men. 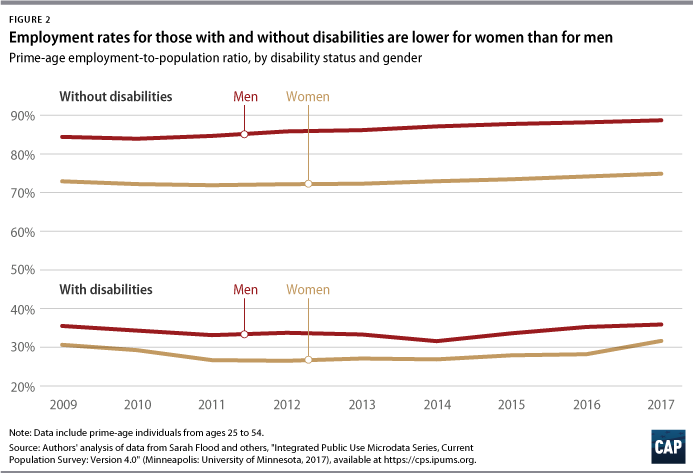 The employment rate gap between men and women, however, is smaller for disabled workers than it is for nondisabled workers. 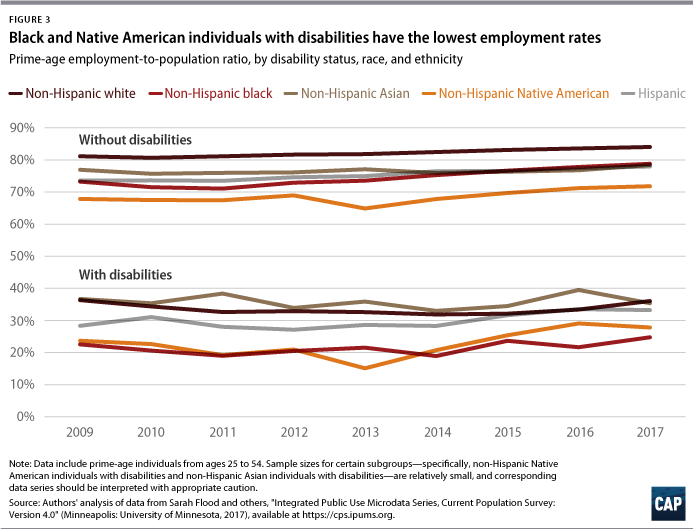 Among workers with and without disabilities, disabled non-Hispanic black and Native American workers have the lowest employment-to-population ratio, while disabled non- Hispanic white, non-Hispanic Asian, and Hispanic workers have similar employment rates. For the nondisabled population, non-Hispanic black workers had a lower employment rate than that of Hispanic and non-Hispanic Asian workers from 2009 to 2014, but in recent years, black workers’ employment rates have caught up to those of their Hispanic and non-Hispanic Asian counterparts. Unfortunately, disabled non-Hispanic black workers have not experienced similar employment gains as nondisabled black workers have, and their employment rate remains 10 percentage points less on average than that of disabled non-Hispanic white, non-Hispanic Asian, and Hispanic workers from 2009 to 2017. It’s important to note as well that prime-age non-Hispanic Native American and black workers also have the highest rates of disability—12.7 percent and 8.4 percent, respectively—while disability rates among non-Hispanic white, Hispanic, and Asian workers are 6.7 percent, 4.6 percent, and 2.1 percent, respectively. Disabled non-Hispanic black workers’ extremely low employment rate is likely the result of compounding barriers black individuals and disabled individuals face while entering and participating in the labor market. In addition to the barriers disabled workers face, black workers must also grapple with societal obstacles—such as longstanding outright hiring discrimination, fewer educational opportunities, and housing segregation—which limit their access to gainful employment. Meanwhile, both communities of color and people with disabilities are disproportionately impacted by the criminal justice system, which adds another layer of discrimination into the mix, as even a minor criminal record can present lifelong employment barriers. African Americans are incarcerated in state prisons at more than five times the rate of white individuals, and individuals with disabilities are more likely to be arrested by the age of 28 than are their nondisabled counterparts. Additionally, incarcerated individuals are three times more likely than the general population to report having a disability. Because incarceration disproportionately affects black and disabled individuals—and since incarcerated individuals are not counted in these labor market data—the figure below likely overstates the true employment rates for these two groups. Considered in isolation, these barriers have detrimental implications for individuals’ lives and employment outcomes. But for black individuals with disabilities, the intersecting oppressions of ableism and racism lead to even worse labor market outcomes. 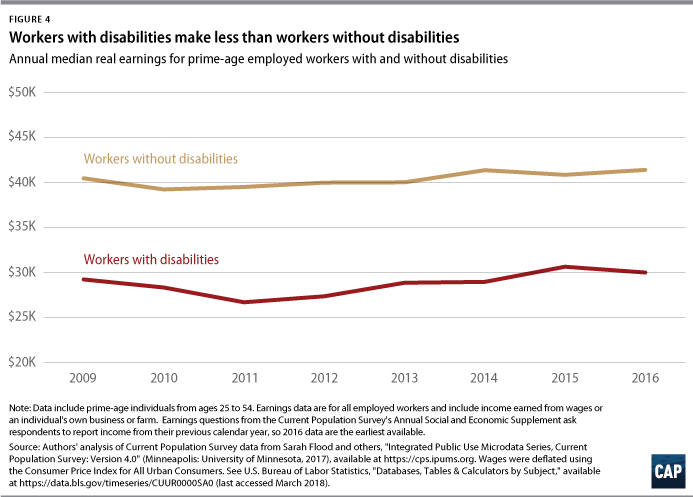 As shown in Figure 4, workers with disabilities receive much lower annual earnings from wages than what workers without disabilities receive. In 2016, for example, median annual wages for disabled workers were more than $11,000 less than those of nondisabled workers. A number of factors contributed to the disabled workers’ depressed earnings. Under an outdated provision of the Fair Labor Standards Act, employers with a certificate issued by the U.S. Department of Labor are legally allowed to pay workers with disabilities a subminimum wage—a wage lower than the federal minimum wage that amounts to as little as pennies per hour for their labor. According to 2012 data from the National Council on Disability, more than 420,000 disabled workers received a subminimum wage under the program, more than half of whom were paid less than $2.50 per hour. The extremely low wages allowed by this harmful policy contribute to the economic insecurity that many disabled workers face. Disabled workers are more concentrated in the service sector, which is also the industry that employs the highest percentage of minimum and subminimum wage-earning workers. Low wages and employment barriers, among many other challenges, have contributed to higher poverty rates for people with disabilities. 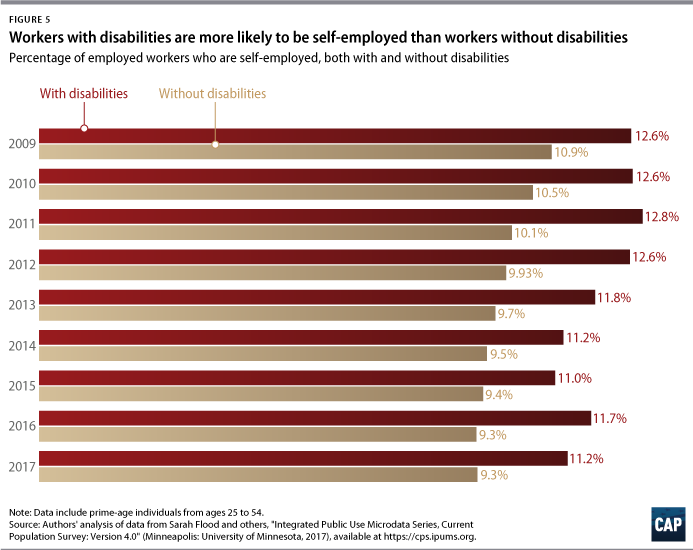 Disabled workers are much more likely to work part time and be self-employed than are nondisabled workers. Workers often turn to self-employment in order to sustain themselves financially when they experience job loss, employment barriers, or an economic downturn. The higher rate of self-employment for disabled workers may be symptomatic of the challenges that they face in the labor force, as self-employment may be one of the only viable options for those struggling to find full-time work due to myriad discriminatory barriers. This alternative form of work provides disabled workers with the freedom to create flexible schedules and customize their work environment to fit their specific needs—benefits they may not be able to find otherwise at a full-time or part-time job. Since part-time work and self-employment are both significantly less likely to offer benefits such as health care and paid leave, the high rates of part-time work and self-employment among disabled workers likely indicate these workers’ precarious economic security. For example, research has proven that well-designed paid family and medical leave policies promote job and income security for disabled and nondisabled workers alike. Overall, the economy is growing and unemployment is at pre-Great Recession levels. 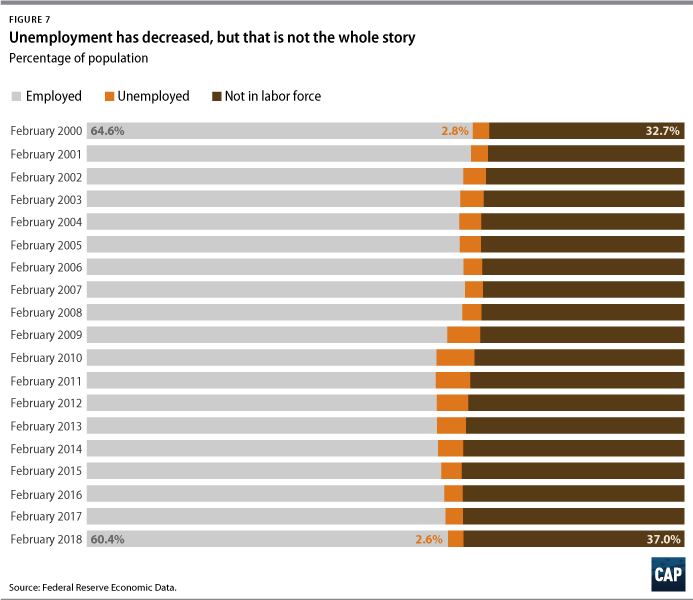 As Figure 7 indicates, however, the employment rate remains below pre-Great Recession levels, meaning that a larger share of people are outside the labor market now than in 2006. This likely indicates that many people have exited the labor market due to long-term unemployment and have not yet re-entered. 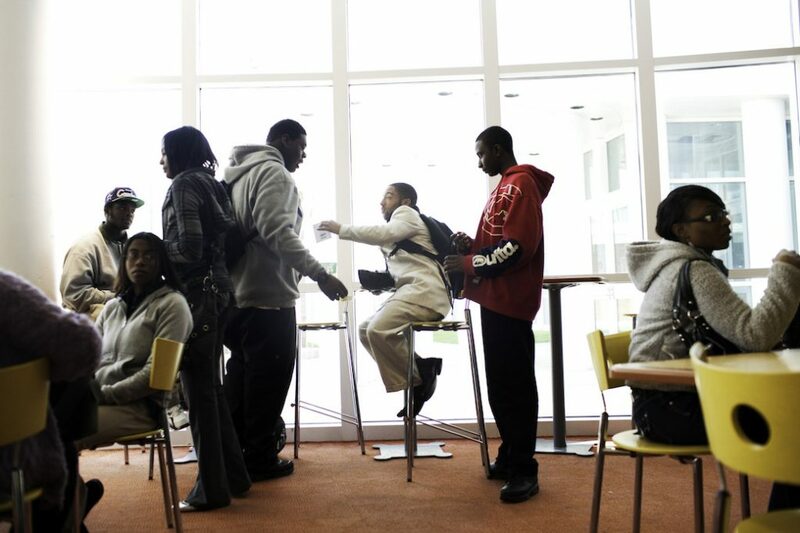 Additionally, although the unemployment rate has returned to pre-Great Recession levels, certain demographics, such as youth and people of color, still face extremely high levels of unemployment and underemployment. 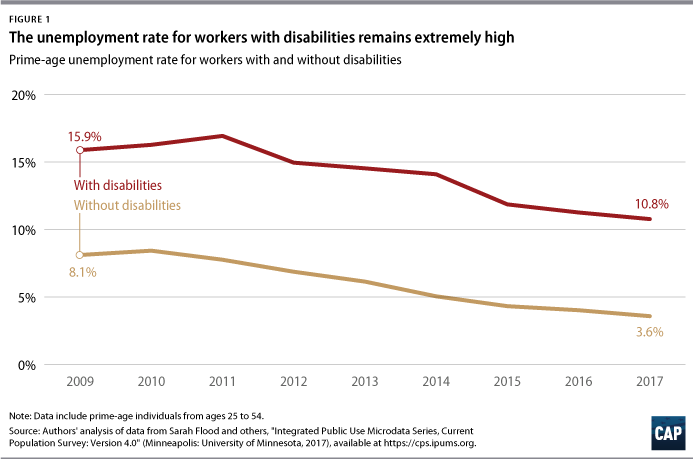 Data presented in this column on the labor market experiences of workers with disabilities show that more work is needed to create a healthy labor market that engages all workers. Despite modest gains, workers with disabilities—especially black and Native American workers with disabilities—are struggling in today’s economy. This is one of several indications that the labor market is not at full employment—and a stark reminder that more policy action needs to be taken to help these workers enter and thrive in the labor market. In addition to keeping interest rates low, the following policies should be implemented to ensure disabled workers can enter and be successful in the labor market if they so choose. As a starting point, policymakers should halt proposals to cut Medicaid—the largest source of long-term services and supports, not just health insurance. Proposed cuts to Medicaid would push disabled workers out of the labor force and back onto the sidelines. Policymakers should also prioritize raising the federal minimum wage and ending the outdated subminimum wage for workers with disabilities—both of which would help to reduce the disability pay gap. Policies that ensure all workers have access to inclusive paid leave and sick days; long-term supports and services as part of universal health care; and affordable and accessible housing and transportation would go a long way in giving disabled individuals a fair shot in the labor market. Expanding the EITC for workers without dependents would help disabled workers, as they are less likely to have dependents and thus are less likely to receive meaningful wage boosts from the EITC. Finally, a disabled worker tax credit would help disabled workers offset the costs associated with their disability, giving more workers with disabilities the opportunity to participate in the labor market. Annie McGrew is a research assistant for Economic Policy at the Center for American Progress. Leonard Scott IV is a special assistant for the Poverty to Prosperity Program at the Center. Michael Madowitz is an economist for Economic Policy at the Center. *Authors’ note: For a comparison of disability data collected by the Survey of Income and Program Participation, the American Community Survey, and the CPS, see https://www.census.gov/topics/health/disability/guidance.html. **Authors’ note: Authors’ analysis of CPS data from 2009 to 2017.